A team led by Dean Felsher found that blocking the expression of five genes can mimic the effect of a protein linked to more than half of all human cancers. A protein present at high levels in more than half of all human cancers drives cell growth by blocking the expression of just a handful of genes involved in DNA packaging and cell death, according to a new study by researchers at the Stanford University School of Medicine. The researchers found that the protein, called Myc, works through a tiny regulatory molecule called a microRNA to suppress the genes’ expression. It marks the first time that a subset of Myc-controlled genes has been identified as critical players in the protein’s cancer-causing function, and suggests new therapeutic targets for Myc-dependent cancers. 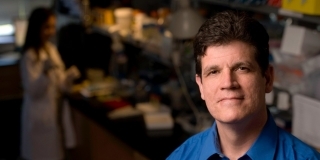 Felsher is the senior author of the study, published Aug. 11 in Cancer Cell. The lead author is instructor Yulin Li, MD, PhD. The gene encoding the Myc protein is a well-known and potent oncogene — a term used to describe genes that cause cancer when mutated or abnormally expressed. It regulates the expression of around 10,000 genes and microRNAs in a cell. Scientists have long known that inactivating Myc, or blocking its expression, can cause Myc-dependent cancer cells to stop growing or die, as well as cause tumor regression in mice with Myc-dependent solid cancers. This phenomenon of dependence is called oncogene addiction. MicroRNAs are small RNA molecules (only about 22 nucleotides) that can, like Myc, regulate gene expression. Previous research had shown that Myc overexpression causes an increase in the levels of a family of microRNAs called miR-17-92. Li found that Myc-dependent cancer cells — either grown in a laboratory dish or as a tumor in mice — in which miR-17-92 expression was locked in the “on” position kept dividing even when Myc expression was blocked. This suggested that Myc works through the microRNA family to exert its cancer-causing effects. We were very surprised to learn that the overexpression of one microRNA can mimic the cancerous effect of Myc. Li then looked for an overlap among genes affected by Myc overexpression and those affected by miR-17-92. Of these, the team found about 401 genes whose expression was either increased or suppressed by both Myc and miR-17-92. They chose to focus on genes that were suppressed because these genes exhibited on average many more binding sites for the microRNAs. They further winnowed their panel to 15 genes regulated by more than one miR-17-92 binding site. Of these, five stood out. Four encode proteins known to regulate how DNA is tightly packaged around proteins (creating a complex called chromatin). This packaging is necessary to allow the DNA to fit within a cell’s nucleus, but it makes it difficult for proteins regulating transcription to access genes. The four proteins controlled by Myc and miR-17-92 affect cell proliferation and senescence by regulating gene accessibility within the chromatin. They had never before been identified as Myc or miR-17-92 targets. The fifth encodes a protein called Bim that induces programmed cell death, or apoptosis. This cellular suicide pathway is used by the body to eliminate damaged or unneeded cells. Bim expression had been previously reported to be affected by miR-17-92. Notably, all of the proteins are known to affect either cellular proliferation, entry into a resting state of the cell cycle or apoptosis, in part by granting or prohibiting access to genes in tightly packaged stretches of DNA in the chromatin. Finally, Li and his colleagues showed that suppressing the expression of the five target genes, effectively mimicking Myc overexpression, partially mitigates the effect of Myc deactivation. Up to 30 percent of Myc-dependent cancer cells in culture continued to grow (in contrast to only 11 percent of control cells) in the absence of Myc expression, and tumors in mice either failed to regress or recurred within a few weeks. Other Stanford co-authors of the paper are former postdoctoral scholar Peter Choi, PhD; postdoctoral scholar Stephanie Casey, PhD; and professor of computer science David Dill, PhD. The research was supported by the National Institutes of Health (grants R01CA170378, U54CA149145, 1F32CA177139 and 5T32A107290), the Leukemia and Lymphoma Society and the King Abdullah University of Science and Technology. Information about Stanford’s Department of Medicine and Department of Pathology, both of which also supported the work, is available at http://medicine.stanford.edu and http://pathology.stanford.edu. Stanford Medicine integrates research, medical education and health care at its three institutions – Stanford University School of Medicine, Stanford Hospital & Clinics and Lucile Packard Children’s Hospital Stanford. For more information, please visit the Office of Communication & Public Affairs site at http://mednews.stanford.edu.